We are not foodies—we are professional diners. Our kitchen is certainly more decorative than utilitarian. Much to the amusement of our friends, we eat out every night of the week. Luckily, we live in a small town that offers big city choices when it comes to dining out. 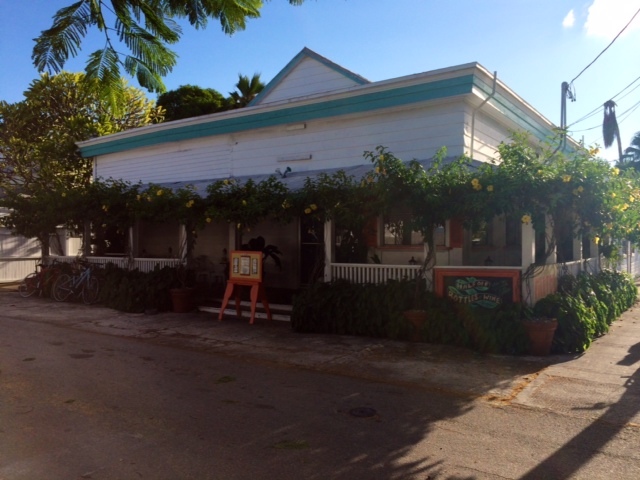 Compiling this list of Our Top 10 Favorite Key West Restaurants was a lot of fun! Some of our top pics are casual and some are fancy. Some of them are reasonably priced and some are a bit pricey. Some require a reservation and some don’t. All of our favorites keep us coming back with terrific food, smiling faces, and great value. The best place for pizza in Key West! We love the Mixed Green Garden Salad, Margherita Pizza, and Chicken Parmesan. Our favorite place for Cuban food on the island. We love the live music, Cuban bread, and ordering by the numbers. We can’t get away from ordering #61 Picadillo Habanero and #92 Mahi Mahi con Salsa de Camarones! Great homemade pasta keeps us coming back! We love the Lobster Linguine, Spaghettini Schmappellini, and Grilled Fresh Atlantic Salmon. Fabulous food and great people watching from the front porch! We love the Caesar Salad, Grass Fed 8oz Burger, and the Soul Mama Seafood Soup. Whatever you choose, order the Cone of Fries! Key West’s best Mexican food! We are always treated like family at Chico’s. We love the Chips and Salsa, Cheese Crisp, Taco Salad, and Chicken Enchiladas. Our favorite place to celebrate a special occasion. We love the boat ride to Sunset Key, dining on the porch, and the gorgeous sunset views. The Pan Seared Snapper and the Honey & Ancho Chile Crusted Waygu Beef Skirt Steak cannot be beat. The best lunch spot on the island. We love the Old Key West feel, beautiful ocean views, and entertaining people watching on Higgs Beach! The Green Salad, Shrimp Salad Sandwich, and Carrie’s Gazpacho keeps us coming back. Delicious and healthy options galore! The Café has the best Spinach Artichoke Dip on the planet. We love the Cream of Tomato Soup, Truffled French Fries, Falafel Sandwich, Grilled Portobella Mushroom Salad, and Café ‘Veggie’ Veggie Burger. Our favorite place to meet friends for dinner. We love the large selection of tapas to share. The Spinach Salad, Dates, Croquettas, Camembert Wedge, and Miniature Quesadillas are always on our list. Save room for the amazing Bread Pudding! We love The Flaming Buoy Filet Company! Many happy memories have been made at this charming and acclaimed, off the beaten path, Key West treasure. Scott, Fred, and their amazing staff always welcome us with open arms. We love the Lobster Macaroni & Cheese, Iceberg Lettuce Wedge, Seafood Marinara, The Filet Co. Three Way, and Spicy Chocolate Quesadilla. The Flaming Buoy Filet Company was an easy pick for our absolute favorite Key West restaurant. The Flaming Buoy Filet Company. Our top restaurant pick! This entry was posted in Dining Out, Key West's Top 10's and tagged dining out, Key West, restaurants on November 18, 2014 by Dean. We love Square 1’s stylish décor! 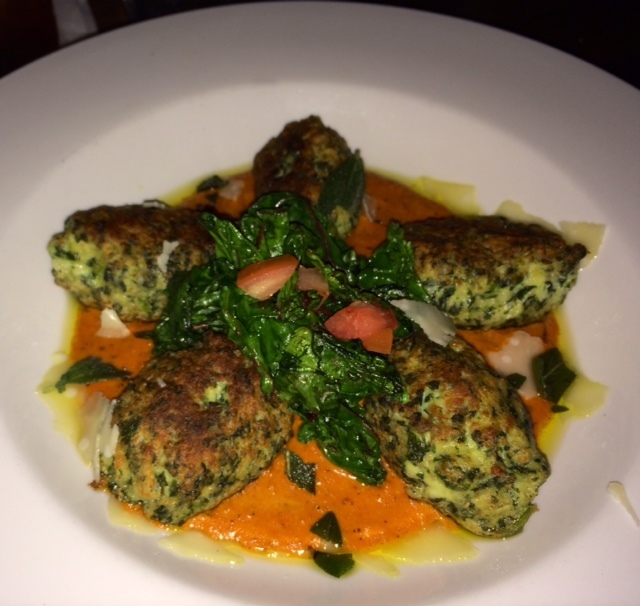 The spinach-ricotta gundi is divine! We love the latest incarnation of Square 1—now open in the legendary restaurant’s familiar location at 1075 Duval Street. Just down from our office in Duval Square, the new Square 1 premiered to rave reviews just a few weeks ago. With the culinary talents behind Banana Café and The Café joining forces to reopen the Key West favorite, Square 1 will undoubtedly continue to be a go-to dining destination for locals and visitors alike. The seafood bouillabaisse special is a hit! On Saturday evening, we joined our friends Jack and Kevin for another visit to the new Square 1. We were delighted once again with the wonderful service, creative cuisine, and stylish décor. Danielle, a familiar face from Banana Café, greeted us fondly. As soon as the cordial hostess showed us to our cozy table by the window, we were introduced to our attentive waiter, who kept us wanting for nothing during our lengthy stay. 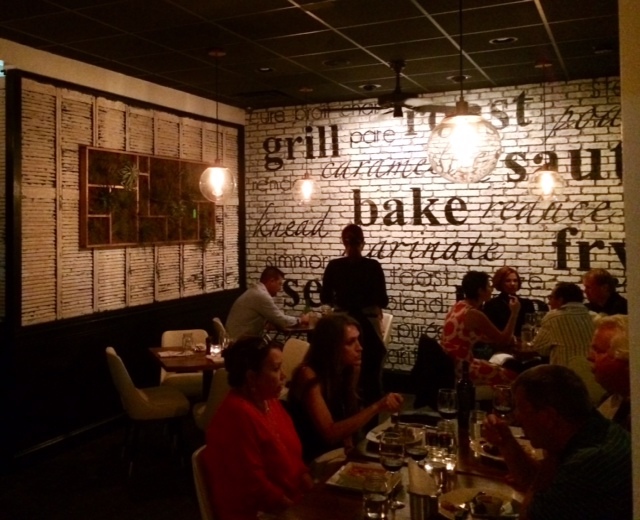 With a wide array of small plates, entrees, and specials to choose from, it was hard to decide what to order. For starters, we selected the devils on horseback, the café cream of tomato soup, and the chef was kind enough to create a special green salad just for Dean. 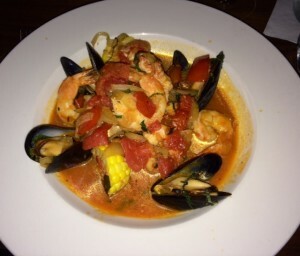 For our entrees, Jack chose a wonderful seafood bouillabaisse special, Kevin and Dean were very pleased with their grilled hanger steaks, and I was thrilled with my spinach-ricotta gundi. We could not say enough about the delicious food, generous table, comfortable chairs, fashionable surroundings, and wonderful artistic touches. Without being rushed to turnover our table, we were free to enjoy desserts, after dinner drinks, and a special night out with friends. 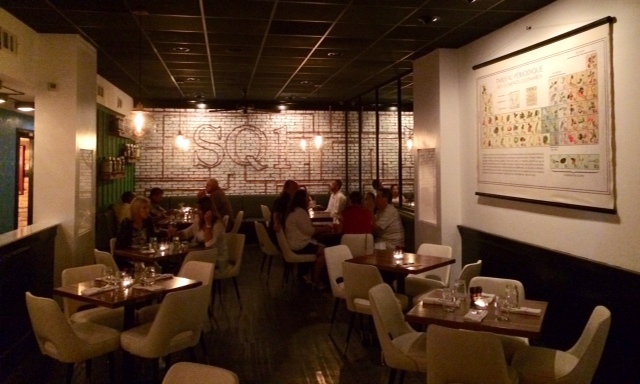 Square 1 gets our vote for the best new restaurant on the island! Click here to take a look at Square 1’s exquisite menu. This entry was posted in Dining Out and tagged dining out, Duval Street, Key West dining out, Key West nightlife, Key West restaurants, Old Town, restaurants on November 3, 2014 by Dean. Just steps off Duval Street you will find one of our favorite funky Key West restaurants, The Café—home of the best spinach artichoke dip on the planet. Much to Dean’s chagrin, spinach artichoke dip is absolutely my favorite food and I am without a doubt a connoisseur of this king of comfort food. Although not on The Café’s regular menu, their bubbling hot spinach artichoke dip is almost always featured as a daily special. The Café’s recipe is extra creamy, packed with fresh cooked spinach, chunks of artichokes, and topped with the yummiest crispy melted cheese. I know, this can’t possibly be a low-calorie appetizer, but that is not the point. Sometimes, we just have to splurge. Besides, The Café offers one of the best selections of vegetarian, vegan and gluten free dishes on the island, so how bad can it be? 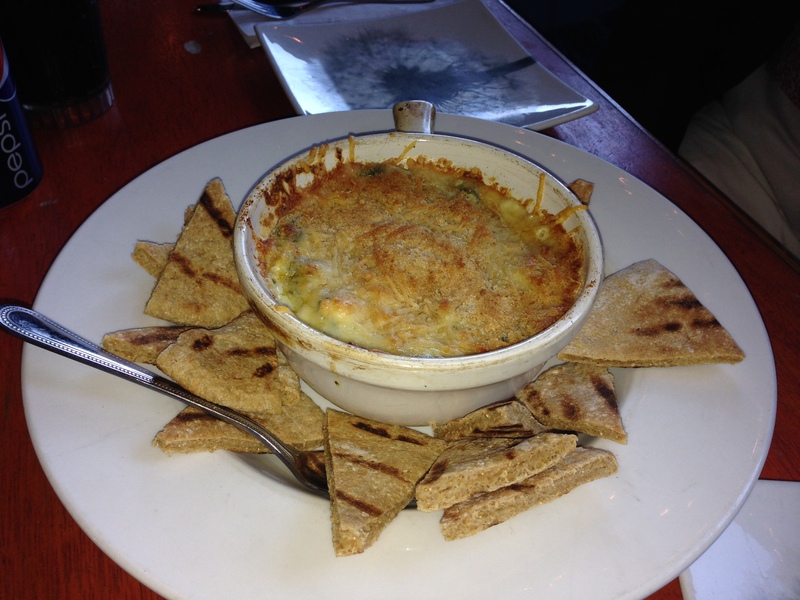 The Café’s yummy spinach artichoke dip with grilled pita bread. I should say that Dean and I are not vegetarians, vegans, gluten free, of follow any special diet—unless you count Dean’s addiction to milk chocolate and Orange Fanta. We simply enjoy delicious food. Since The Café serves a delectable selection of generously portioned dishes, it always delights. Besides the incredible spinach artichoke dip, we love many of the wonderful items on The Café’s menu. For starters, we highly recommend the cream of tomato soup, the spring rolls, and the truffled French fries. Dean loves the falafel sandwich and I’m thrilled that they make their veggie burger with legumes, carrots, broccoli, mushrooms, scallions and sunflower seeds. You will never forget the big-as-your-head Udon Bowl, made with homemade dashi broth, vegetables, shitakes, seaweed, udon noodles and tofu or clams. The selection of stir frys is terrific, the grilled pizzas are great, and the featured salads are more than fresh and tasty. A stroll to The Café, at 509 Southard Street in Key West, is well worth it. If you simply can’t drag yourself away from your poolside lounge chair, The Café offers free delivery. Click here to explore The Café’s terrific menu. 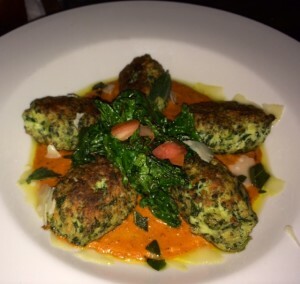 This entry was posted in Dining Out and tagged dining out, gluten free, Key West, Old Town, restaurants, spinach artichoke dip, vegan, vegeterian on March 19, 2014 by Dean. 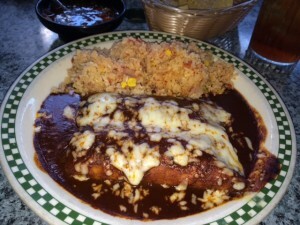 Love the mole chicken enchiladas at Chico’s Cantina! We love the Mexican cuisine at Chico’s Cantina on Stock Island. Located at 5230 U.S. 1, just across the Cow Key Channel Bridge from Key West, dining at Chico’s is well worth the short trip. Family owned and operated since 1984, Chico’s seasoned and friendly staff always makes us feel more than welcome. We love having our favorite beverages, along with a generous serving of hot tortilla chips and fresh salsa, placed before us as soon as we settle in. Decorated with a delightful mix of south of the border kitsch and old Key West charm, the covered outdoor patio is the perfect spot to relax with friends and family. Famous for their locally caught fish tacos, Chico’s combines fresh ingredients to create a wonderful array of savory Mexican appetizers and entrees. I am usually torn between the delicious seafood enchiladas and the special mole chicken enchiladas. The fresh taco salad and the ground beef chimichanga top Dean’s list. Dean’s mom, Kathleen, is partial to both the cheese crisp and the deluxe chicken tacos. Chico’s tempting daily specials and generous menu selections keep us coming back for more. Hands down, Chico’s Cantina serves the best Mexican cuisine in Key West. Click here to enjoy Chico’s Cantina’s delectable menu. This entry was posted in Dining Out and tagged dining out, Key West, mexican cuisine, restaurants on February 28, 2014 by Dean.